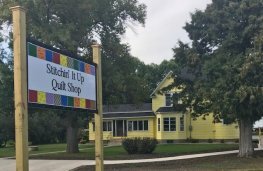 Stitchin' lt Up Quilt Shop is a quilt shop located in Lamberton in southwestern Minnesota. We offer high quality quilting fabrics, a large selection of quilt patterns, and quilt kits. Most online orders are shipped next business day with a low $5.95 shipping fee on U.S. orders. Our goal is to provide you a personalized shopping experience without leaving the comforts of your home. Please contact us if you have any questions. We hope you enjoy your shopping experience with us.